A 35-year-old male visited our hospital for the evaluation of uveitis for 6-month duration. On examination, the best-corrected visual acuity (BCVA) was 6/60 on the right eye and 6/60 on the left eye. Fundus examination revealed moderate vitritis and an area of retinitis in the superior midperiphery associated with yellowish retinal precipitates on the both eyes [Figure 1]a and [Figure 1]b. Laboratory examination shows a positive finding of rapid plasma reagin and treponema pallidum hemagglutination (TPHA). A positive result on the ELISA and Western blot test confirmed the infection of the human immunodeficiency virus (HIV). The patient had a homosexual history with CD4 T-cell count around 64 cells/mL. Under the impression of ocular syphilis coinfected with HIV, the patient was treated with intravenous penicillin for 14 days. Rapid resolution of the vitritis and retinal precipitation were noted. Two months later, BCVA recovered to 6/7.5 and retina showed minimal retinal pigment epithelial changes [Figure 1]c and [Figure 1]d.
Our case revealed vitritis and retinitis associated with creamy yellow retinal precipitates. These multiple retinal precipitates overlying retinal vasculature suggested epiretinal lesions. Comparing the diameter of these spots to the width of retinal vessel, these yellowish retinal spots estimated around 50–150 μm in size,,,. Meyer et al. first reported that multiple, small, yellow retinal infiltrates were observed in a patient with ocular syphilis. Reddy et al. described a 42-year-old TPHA-positive case who developed inflammatory precipitations overlying an area of retinitis. Using optical coherence tomography, the authors showed that these lesions were both superficial and adherent to the retina. Rodrigues et al. investigated the characteristics of yellowish dots in 12 patients. They found that retinal precipitates were usually located in the perivascular region and assumed that preretinal dots are due to perivasculitis secondary to treponema infection. Fu et al. analyzed the risk factors of retinal precipitations in eight patients. They found that such yellowish precipitates can occur in patients with syphilis, regardless of immune status, HIV positivity, or sexual preference. The observations in our patient and a review of the literature lead us to believe that superficial retinal precipitates overlying areas of retinitis are highly suggestive of syphilis. Rapid resolution of these yellowish dots after treatment further confirmed the association of these dots and syphilis. Contrary to yellowish dots located mostly at perivascular retina in previous reports, our case revealed even and discrete distribution on retinitis region. Our observations also suggested that perivasculitis seem not to explain completely the pathogenesis of retinal precipitations. Further studies are required. Besides, similar epiretinal lesions have been described in the absence of retinitis in patients with sarcoidosis. Small intraretinal lesions may mimic epiretinal precipitates in patients with herpetic retinitis, Behcet's disease, etc,,,. Cautiously, the differential diagnosis is necessary. The global incidence of syphilis has remarkedly increased since 2000 AD. However, only sporadic cases with syphilitic retinal precipitation reported previously because clinical practitioners seem not be familiar with this finding,,,. The presence of preretinal dots overlying retinitis is highly suggestive of ocular syphilis. Careful retina examination is important in the early diagnosis and treatment of syphilis. The authors certify that they have obtained all appropriate patient consent form. In the form, the patient has given his consent for his images and other clinical information to be reported in the journal. The patient understands that his name and initials will not be published and due efforts will be made to conceal their identity, but anonymity cannot be guaranteed. Rodrigues RA, Nascimento HM, Muccioli C. Yellowish dots in the retina: A finding of ocular syphilis? Arq Bras Oftalmol 2014;77:324-6. Fu EX, Geraets RL, Dodds EM, Echandi LV, Colombero D, McDonald HR, et al. Superficial retinal precipitates in patients with syphilitic retinitis. Retina 2010;30:1135-43. 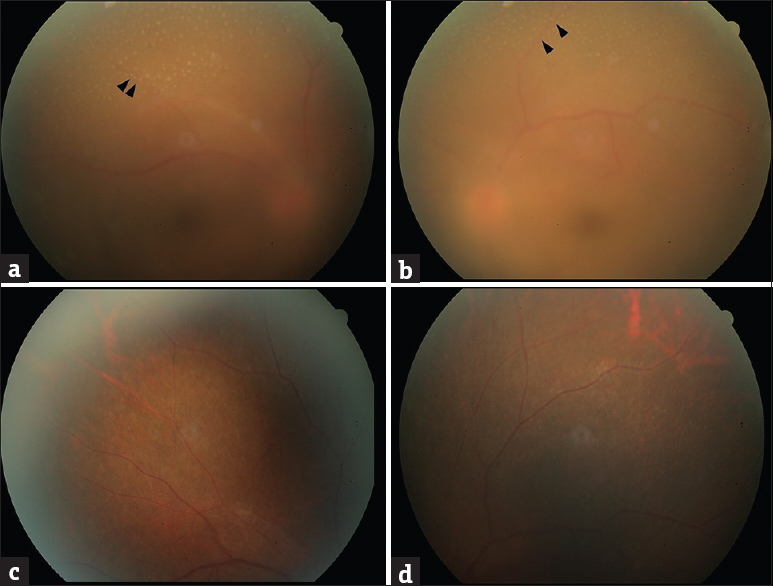 Yang P, Zhang N, Li F, Chen Y, Kijlstra A. Ocular manifestations of syphilitic uveitis in Chinese patients. Retina 2012;32:1906-14. Chen YJ, Horng CT, Chen JT, Tsai ML. Acute syphilitic progression in an HIV-positive patient. Am J Med Sci 2009;338:325. Meyer CH, Silva-Papi M, Mennel S. Chorioretinitis of uncertain origin in a young man. Ophthalmologe 2004;101:518-20. Reddy S, Cunningham ET Jr., Spaide RF. Syphilitic retinitis with focal inflammatory accumulations. Ophthalmic Surg Lasers Imaging 2006;37:429-31.